Kang Yoon-sung was once an actor with a single credit under his name. He himself stated “I knew I had no talent in acting” – and one could say thank god for that, since because of it, Korean cinema gained a talented writer and film director, whose debut feature conquered both domestic and overseas markets. The Outlaws is a thrilling crime action film that keeps the viewers on the edge of their seats. 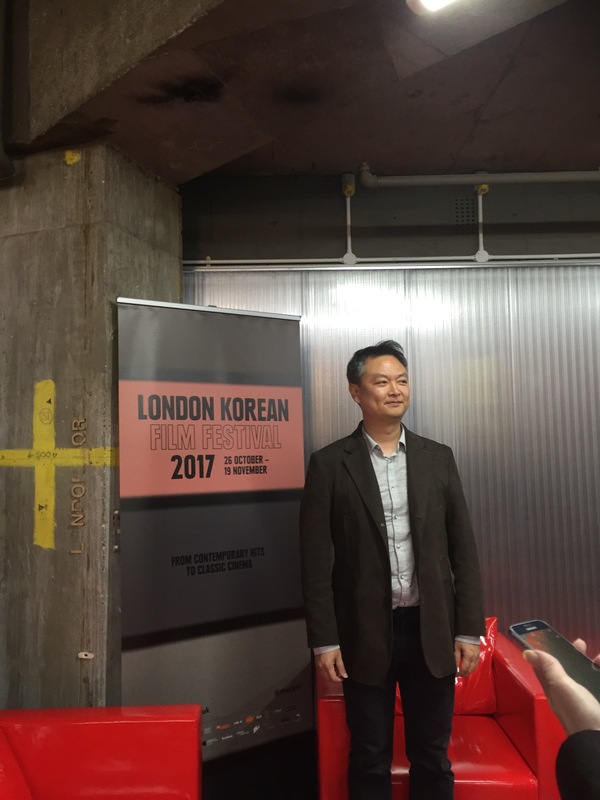 We spoke to the filmmaker during this year’s London Korean Film Festival. View of the Arts: ‘The Outlaws’ is your first film. What were your creative thoughts when you first conceived this project? Were there specific things/ ideas you wanted to explore? Kang Yoon-sung: First I got to hear about this story was through a detective back in 2007 or so; it was a true story as well. I decided to make a detective story, as realistic as possible. It is a story that happened in 2004, a story about detectives and the crime squad who were investigating and arresting violent criminals at that time. And rather than focusing on the investigation process, I wanted to focus more on those who were becoming actively involved in arresting the criminals. I wanted to show the detectives that actively overcame those criminals. That’s were I put more of the film’s focus. Hangul Celluloid: You said that your film is based on a true story; and if you look at the Korean cinema, in the last couple of years, there have been other films that are based on true events: Roaring Currents, A Taxi Driver etc. ; they have consistently broken box office records, to the point where Korean cinema became popular again. What do you feel contributes to the popularity of the Korean cinema? Do you think it’s that people are interested in true life stories or are films becoming better? Kang Yoon-sung: In my opinion, the Korean audience is much more interested in real life stories rather that the ones that are pure fiction. They like stories that they can believe in, the tales that are true. That’s probably why those films are much more successful. MyM: Was there anything that was particularly challenging about trying to transfer the story, the actual events that happened, to change them and put them on the big screen? Kang Yoon-sung: In terms of portraying the detective, we did a lot of research and interviews through which we got a lot of information and factual details. Those were easy to convey in the film, but on the other side, for the gangsters or mobsters in the film, we weren’t able to get much information, so we had to rely on our imagination. The 405: The characters were portrayed on screen without much exposition at all, there wasn’t a backstory to them. It was like: this is our detective and he is this way, for no reason, expect that to be him as a character. I am wondering if this was a conscious effort as you were writing, you were like, I don’t want to fill it with fluff, I want action, action, action? Kang Yoon-sung: Generally, in films you will see characters’ histories and their backstories; their past actions. But in my film, I eliminated all those elements deliberately, for the good and the bad guys. You focus on both the detectives and the villains as people. In terms of the villains, I wanted to emphasize the evil they were doing rather than their backstories. View of the Arts:The film is full of interesting characters, Ma Dong-seok’s and Yoon Kye-sang’s in particular. What was the auditioning process like for these roles? Kang Yoon-sung: In the film, the protagonist is played by Ma Dong-seok, who is actually my friend. Four years ago, whilst planning the film, we decided that he will be playing the protagonist, and we discussed together how to create the best character possible for him in the film. In terms of the villain who is portrayed by Yoon Kye-sang, well, he never played an evildoer in the film before. I wondered what it would be like for him to play one. I thought that it would be a very different image from the characters that he had played before. The villain role might come across to the audience as quite a shock, but at the same time, it might also impress the audience. Hangul Celluloid:Talking about Ma Dong-seok – if you look at the roles he played over the years, the humour he brings to the characters seems to be very much his personality, which also shows in your film. Was Ma Dong-seok involved pretty much from the outset? How involved was he in the humorous parts of the screenplay and how much of it was written by you? Kang Yoon-sung: From the beginning of the film, we decided that the detective character will be much more humorous, whereas the character of the villain will be much more tense and thrilling. And that was our goal that we had right from the outset, and that was how we filmed it. So in the terms of Ma Dong-seok’s persona, half of the humour was written prior to the filming, but whilst we were on the set, we would discuss it further. Ma Dong-seok also improvised. MyM: There was a really good balance between the action scenes, the violence and the humour. Why was it important to have the intense action scenes, but also to keep it light-hearted as well? Kang Yoon-sung: My view of commercial films and their entertainment value is that they really need to contain a range of human emotions, from sadness and happiness to sorrow, and if they are not playing with people’s emotions, then the audience does not find them entertaining. That’s why it was important for me to balance those emotions, and to have all of those elements present in the film. The 405: Action sequences are great in the film. As it is your first film, having done such good choreography, with some long-shot action scenes, I imagine it must have been challenging. Which scenes did you find particular hard to film, what was the biggest challenge to film? Kang Yoon-sung: In the film, there is lots of action, and during every second of the filming, I was very tense; I was afraid that we might have some accidents happen. When we were designing the action scenes and the long shots, we found them to be hard, as the actors were tired – we shot certain scenes 5 times. Fortunately, the last cut turned out good and everything went well. View of the Arts: Films evolve through a creative process – sometimes most dramatically in the editing process. How was that for you? Are you satisfied with your final product? Kang Yoon-sung: What I did was that on every day that I filmed, I also edited on that day and I finished editing on that day. I must admit, I spent a huge amount of time on that. The edited cuts that we got from each day weren’t that much different from our final cut, apart from that the film’s length was a bit shorter in the final cut. I really did invest a huge amount of effort on the set editing, and I am happy with the final product. Hangul Celluloid: Over the years, I think we have all talked to directors about the difficulties they face in making and funding their films. Could you tell us of your experience in getting the film funded? Kang Yoon-sung: In the beginning, we have decided that the role of the detective will be played by Ma Dong-seok, and eventually, we got to cast the villain and that wasn’t easy in itself. But the two actors who played the two main characters in the film aren’t big stars so getting the funding for the film wasn’t very easy. Big film studios and major film companies in Korea all rejected to fund the film. We eventually went to a young, brand new film company to get the total funding, which was around 670,000,000 Korean Won (approximately $44 million dollars). We had a very difficult start to make the film and nobody expected much from it, but fortunately, the film came out well, it got a good response and it did very well in terms of the audience number. Now the situation has reversed (laughs). MyM: I read in another interview you did that ‘Reservoir Dogs’ is actually one of the films that influenced you to become a film director. Why has that film inspired you and did it have any influence on ‘The Outlaws’? Kang Yoon-sung: The first time that I watched Reservoir Dogs – before that I of course really enjoyed watching films, and I watched a lot of films – but when I watched that film, I really felt the way the story unfolded and developed, and the style of directing were very different; that’s when I really became determined to write myself and to become a film director. So that film became a standard for me in a way, to practice writing in a different way from the stories in other films; in that sense, it influenced me to write my own film. The 405: The writing is tight, the editing is good, everything is good. I really want to know about the colours in your film. I have noticed that each gang had its own colour, and when they were fighting together, there were multiple colours on screen, was that intentional? Could you tell me more about the design of the film? Kang Yoon-sung: Right from the beginning of the script stage, it was pointed out that there were too many gangs in the film and that it might be quite confusing. Rather then trying to overcome that, we tried to have a different sense and atmosphere for each of the gangs, and one of the ways to achieve that was to use different colours; one of them was green, the other one was yellow – depending on which scene it was, the colour would slightly change. View of the Arts: How long did it take you to write the script and how long did the pre- and post-production take? Kang Yoon-sung: Writing the script in total took 3 years, to get that story structure. At the beginning, I actually had three characters; there were to be two detectives against one villain. Partly for casting reasons, so that we would get mid-level actors, sort of bright new stars to join, but because of the funding reasons, we didn’t go ahead with that idea; we killed one off, and decided to have one good guy and one villain. The pre-production didn’t take as long as I thought it would; it was a total of 4 months, the filming took 3 months, and the post-production about 4 months. So it took about a year in total to make the film. Hangul Celluloid: Everybody has been talking about your film and talking about your directing that is fabulous. I am obsessed with the new Korean cinema from the late 90s. You were an actor in ‘Please Teach Me English’, which is a classic rom-com; now that you are a successful director, a very successful one, what are your thoughts about your acting career? Kang Yoon-sung: Of course I am very embarrassed (laughs). I really wanted to be an actor in the past, but I knew that I had no talent in this area. I did appear in this film, but I think that I was edited out (laughs). I said in some interviews in the past that, because I said that I wanted to be an actor, people would ask me if I was preparing to be an actor in the future, but that’s not the case and I am just going to be fully focused on directing in the future.